As a mom of three active kids, most of my life is spent behind the wheel either in the carpool lane, in a parking lot, or on the highway traveling to events. A few months ago, I blogged here about my frustrations with not being able to chat with my kids while driving. How is it possible to safely lip read children while cruising 75 miles an hour down the interstate? In the past decade, Lipreading Mom has worn two other sets of hearing aids, which were paid for out of pocket: $8,000 total. My hearing loss progressed this year, making both hearing aids ill-equipped to help me any longer. I missed so much sound. The hardest part was missing out on my children’s voices in the car. I couldn’t understand them unless I glanced at their lips through the rearview mirror. Several times, I got in near car accidents from doing this. New hearing aids were needed, but our family just couldn’t afford any more out-of-pocket hearing technology expenses. Unbeknowst to me, officials with ReSound hearing technology headquarters read my blog posts about highway lipreading and offered me a solution: new Verso ReSound hearing aids and a ReSound Unite Mini-Microphone. As long as I blogged about their products, I could have these products at no charge. I am thrilled to announce that ReSound, manufacturer of hearing technology, is partnering with Lipreading Mom on the Show Me Your Ears Campaign. In exchange for my new hearing aids and Mini-Mic, I will post a series of stories and photos about my experiences with using this technology. Let’s call these posts Diary of a Lipreading Mom! 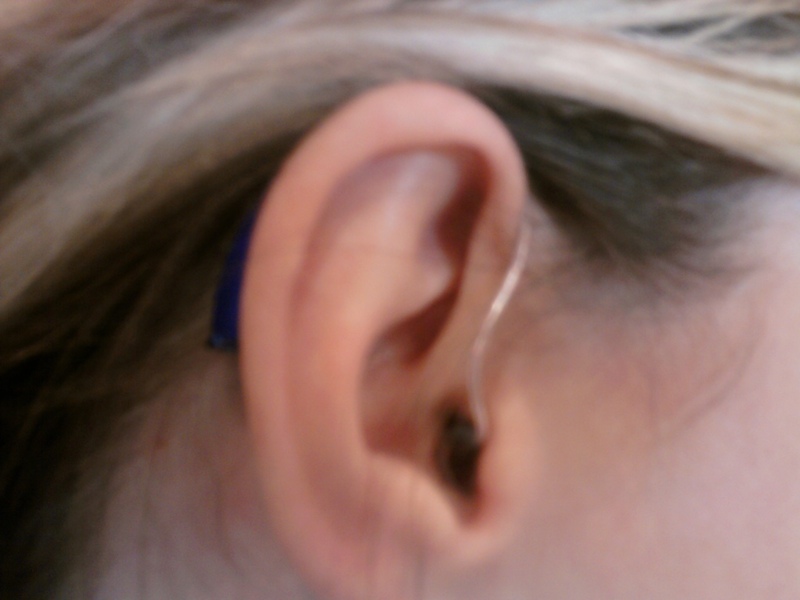 Can you see my new hearing aid? 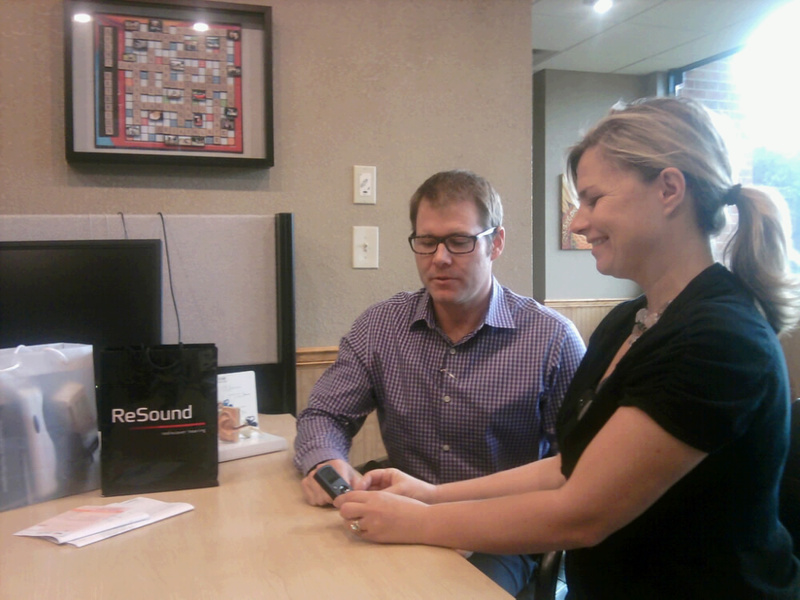 Now you can… One of my new ReSound Verso hearing aids! 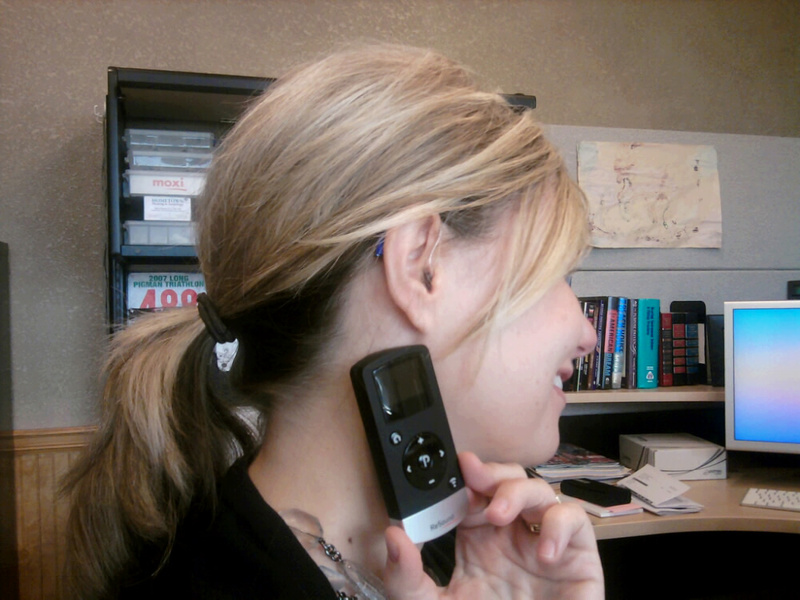 My ReSound Verso hearing aids come with a wireless remote to adjust from quiet to noisy settings. Cool, huh? Brent Peterson with Hometown Hearing in Kansas City performed my hearing aid fitting. I’m still admiring that wireless remote. Immediately after leaving Hometown Hearing with my brand new ReSound hearing aids and wireless Mini-Mic, I tested them out in the car. “When was the last time we could talk in the car while I drove?” I asked my husband who sat in the passenger seat. He wore the Mini-Mic on his shirt collar. “Fifteen, 16 years,” he said. “Really?” I wanted to make sure I’d heard correctly. “Did you hear what I said?” he asked. And that, my friends, is the first time since 1997 or so that I’ve had a car conversation with my husband without having to lip read. In future posts, I will go behind the wheel with my kids in the backseat, each taking a turn with the Mini-Mic. I wonder what they will say to me? 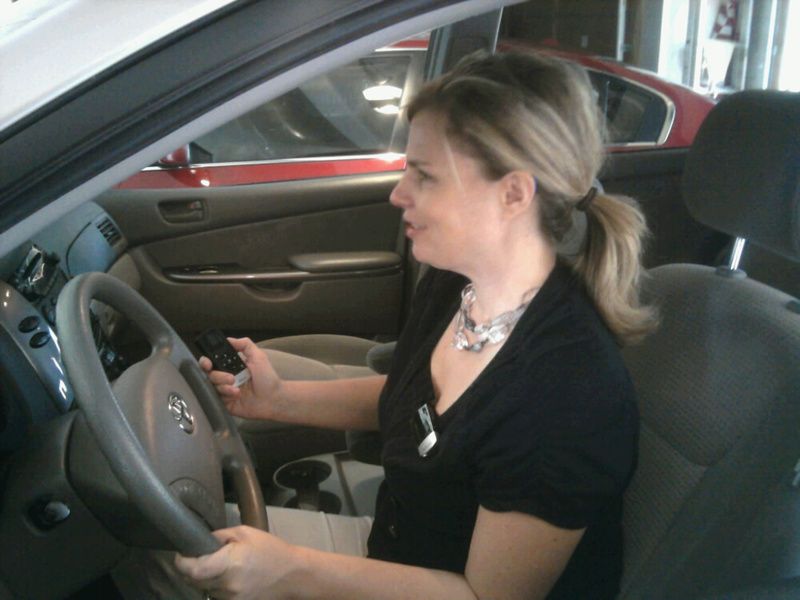 Highway driving with the ReSound wireless Mini-Mic is a lot safer than lipreading, don’t you agree? Wahoo! I am so happy for you – and thankful for your new sponsor! BTW, while I am wearing my old aid and waiting for my new one to be fixed, I cannot understand my daughter much when she talks to me in the car. West becomes Went, etc. The new aids now are AMAZING! Marsha – It’s amazing what hearing technology can do. I hope your hearing aid gets fixed soon. I can’t go anywhere without my mini-mic or I call it my “wife mic”. You can buy a car adapter and plug it into the car to charge it. I haven’t had issues with it yet. The phone clip is another good device to have. Also the mini-mic is good for webinar or watching TV. You can have one of your HA’s programs to Music and use that for TV and it is so clear. I can’t wait to get my Verso. I am happy with my Alero 962TSG but I heard Verso is so much clearer. I definitely need the TSG program which is not available yet for Verso. That’s great! We need to compare notes on how these products work for us. This is fabulous news! A big thank you to Resound for stepping up! I hope these new hearing aids have a TELECOIL program, that it has been turned on. Let me know how you use the T program and the M/T program! One of the greates joyes is to be able to hear and understand your childrens’s voices. Congrats! Fabulous, Shanna, and congratulations! Wow! Whatever each of the children says using the remote, it will be music to your ears. That is awesome, I am so happy for you! I got a pair of ReSound Aleros this past August and they have been amazing! (So I completely understand how happy you must be) I never knew my tv made a ding-ing sound when I turned it on and off until I got the new Aleros. I will have to get a picture and send it to you! Yea!! This has to be so exciting for you. Amazing how there are such wonderful people and businesses out there, ready to help. Very inspiring! God Bless you! I’m sooooooooooo happy for you!!! God comes through when we least expect it. I appreciate hearing good news and I’ll pass it on to my friends who are hearing impaired. Hurray! What a wonderful answer to prayer and a practical solution! Thank you, RJ. Glory to God! Very true. 🙂 Thanks, Nicole! First words from the back seat into mini mic, “MOM, she’s touching me!” Wouldn’t it be adorable if they sing to you? I wonder what they will do too. Am very curious to hear of your adventures. Congrats and keep us posted! Oh, Shanna! I am so happy to hear all the news! So happy for you and your family. You deserve this. They certainly picked the perfect person to sponsor. I’m so excited for you. I know when I recently received my new hearing aids they amazed me. The technology today has really improved. And as an interpreter mine are crucial. If I can’t hear I can’t work. In reference to your earlier comment, I would like to hear others comments on various items available and their thoughts. My aids came with a t-coil also, but my audiologist couldn’t get it working right so they just turned it off. My loss is progressive also and the phone has really become a problem. I was working a job in a really loud environment last week and an important call came in on my cell during a break and I could not hear it at all. If I hadn’t had caller ID I wouldn’t have known who it was. I finally yelled in the phone, I’ll call you back! And hung up. The Deaf client I was working for saw me take the call and move the phone all over my ear trying to get my aids to pick up enough to hear what was being said, but no luck. The client asked me what that was all about and I explained and they thought it was really funny. So I was the entertainment for the night as well as the terp. I have the same problem in a mall or other places with a lot of ambient noise. I alternate from talking into the phone and then move it up on top of my aids to pick up what they are saying. I guess to others it looks like I’m slapping myself in the face with my phone. I hope your t-coil works better than mine did. T-coils are really old technology and I don’t think they interface well with a lot of the new technology. Your thoughts? Terps – It is my understanding that T-coils work best with people who have lost most of their hearing. Since there is a quiet buzzing noise in the ear when the T-coil setting is on, some of us who still have a bit more residual hearing might hear this buzzing…while those with more severe loss may not. At least, that has been my past experience with T-coils on former hearing aids. I will blog about the T-coils on my new ReSound Versos in the future. What wonderful news you can now hear your children’s voices again while driving. I think there are many of us mom in the US and here in Canada where I live that have been struggling with hearing loss as well. 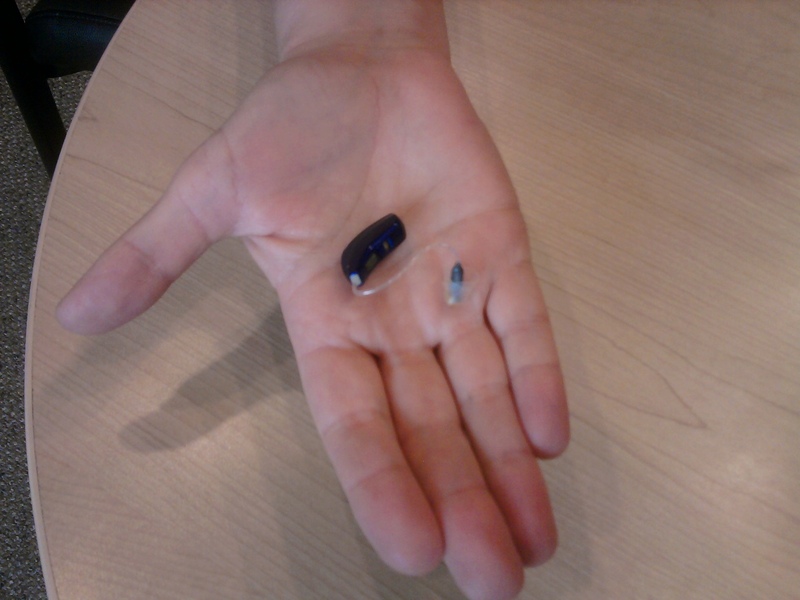 I now cannot hear on the phone even though I have aids that are just 2 years old made by Starkey S-series. Hearing voices in the car is impossible as well. Congratulations to you on your new aid and new living as well. I am looking forward to learning more about how your Re-sound aids are helping you. Please ask them how to use your Tcoil with Fidelio manufactured by Doremi. That is the other device available at AMC and Cinemark. I have to use a personal neck loop connected to the Fidelio. I still use the CaptiView. I do not understand how hearing aid users’s Tcoil works with a Fidelio. Shanna, this is so exciting, I am so happy for you, and looking forward to your blogs about your experiences with your new hearing devices. After using my hearing aid (I only need one since I am completely deaf in the left ear) for 3 years, I was told when I went for an adjustment that it has a t-coil in it and would I like to use it. Of course I said yes. She then told me how to use it. Now, I can hear much better on the phone. Using the phone was so bad before, that I was planning on getting a CapTel caption phone. Now will put that off until my hearing gets worse. I love the t-coil. It’s wonderful that you now hear your family when you are in the car. Thats awsome how they are letting you wear the hearing aids for talking about them on your blog, and for joining in with your campaign. 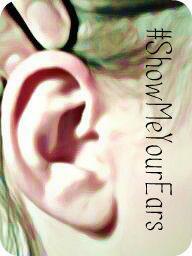 Look forward to more stories of your new found hearing. The remote does look lovely. I have remote for my Phonak nathos hearing aids, which has not long ago been paired. I muse get round to blogging about it. YAY!! Congratulations to you & your family. Not only can you hear them, but you can also be much safer on the road, which is great for everybody. Yes I am delighted there is something like this that helps us hear while driving. I know we all feel the frustration of trying to communicate while driving. I have been near tears while on road trips with my daughter to dog shows we attend. It is a terrible feeling not being able to join in conversations while driving or anytime really. Looking forward to knowing more about this new product…. Thank you, Lorraine and Sandy! I will blog more about my ReSound products very soon. Please stay tuned! I wish I could like this a kajillion times!!! How cool that they found your blog and sent it right over! You know you’re making a difference when…. HUGE congratulations! What a blessing! Rachel – Thank you so much. I consider hearing my kids better a blessing, too! What a beautiful story and I am so happy that those precious children can now talk to you without you having to lipread. I believe with Lisa Newkirk that God’s hand is guiding Resound and helping people to emerge from a world of silence. I got my Verso’s yesterday…..waaaaaaaa hoooooo! Great, Tony! Let us know how things go with them. Thanks, I’ll keep in touch.